Arkham City isn't just a game, it's a multimedia event. Batman probably doesn't listen to music while he's patrolling Arkham City, but that doesn't mean that you can't. And what better to listen to while fighting crime and protecting the weak than an entire album of music inspired by the Dark Knight himself? Batman: Arkham City - The Album contains eleven tracks from a really diverse pool of artists and bands. Included on the album are the likes of electronic band Blaqk Music, indie rock band The Raveonettes, and System of a Down front man Serj Tankian. The artists on the album are pretty varied, so there's almost certainly going to be at least one band that you like on there, and perhaps some you never knew you liked. There are two ways to get your hands on the album. The first is just to buy it when it goes on sale on October 4th. Alternatively, if you can wait a couple of weeks, you can get it as part of the Collector's Edition of Arkham City, and get the bonus track by noise rock band A Place to Bury Strangers. Coheed and Cambria singer Claudio Sanchez said writing a song for the album had been very different to how he normally worked, and that he had tried to find the universal themes within the Batman continuity, so that the song fit properly in that world. Of course, none of these bands makes a habit of writing songs about Batman, so it was probably an unusual experience for them all. 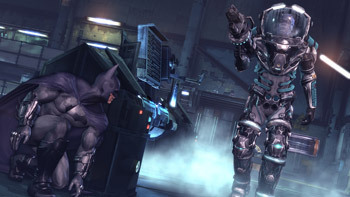 Batman: Arkham City comes out for PC, PS3, and Xbox 360 on October 18th.